MANUAL PLASTIC INJECTOR (4” CYL. 6333 psi) includes a digital temperature controller, transparent safety shield, easy view large hopper assembly, aircraft spec. aluminum body insulated to prevent heat loss through the mainframe. Optional air operated hopper. ERGONOMICAL WORKSTATION BENCHTOP MANUAL PLASTIC INJECTOR (4” CYL. 6333 psi) includes digital temperature controller, transparent safety shield, easy view large hopper assembly, aircraft spec aluminum body insulated to prevent heat loss through the mainframe, lever operated power clamp, adjustable mold stop with automatic ejector, adjustable mold clamp for molds with different thicknesses. Optional air operated hopper. SEMI-AUTOMATIC PLASTIC INJECTOR BENCH TOP (4” CYL. 6333 psi) includes digital temperature controller, transparent safety shield, easy view large hopper assembly, aircraft spec aluminum body insulated to prevent heat loss through the mainframe,adjustable mold stop with automatic ejector, adjustable mold clamp and resettable production counter. The injector ejection and clamping are also easily adjustable on the fromt panel by electronic timers. Optional air operated hopper. SEMI-AUTOMATIC PLASTIC INJECTOR FLOOR MODEL (4” CYL. 6333 psi) includes digital temperature controller, transparent safety shield, easy view large hopper assembly, aircraft spec aluminum body insulated to prevent heat loss through the mainframe. This new AB-300-4 Ergonomical plastic injector was designed for high volume injection of plastic or wax patterns with maximum operator speed and comfort to free the operator's hands for faster handling of molds. The mold stop and the mold clamp are adjustable in order to easily accommodate various thicknesses of molds. The injection, ejection and clamping are also easily adjustable from the front panel by electronic timers. Air operated hopper included. SEMI-AUTOMATIC PLASTIC INJECTOR 5 TON 10 GRAM (1/4,1/3 or ½ OZ.) SHOT CAPACITY and up to 12,228 injection pressure @ 125psi. Standard equipment includes a programmable temperature controller, resettable production counter, 30 oz. Capacity air-operated hopper, mold stop and clamp adjustable to accommodate various size molds. The injection ejection and clamping are also easily adjustable on the fromt panel by electronic timers. Air operated hopper included. MANUAL BENCH TO PLASTIC INJECTOR UP TO 14 GRAM (1/4, 1/3 & ½ oz) SHOT CAPACITY. Standard equipment includes programmable temperature controller, 1/2 oz. 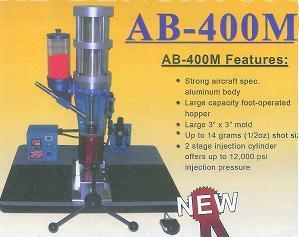 Capacity air operated hopper, mold stop and clamp adjustable to accommodate various mold sizes. The 2-stage injection cylinders offer up to 12,000 psi injection pressure.